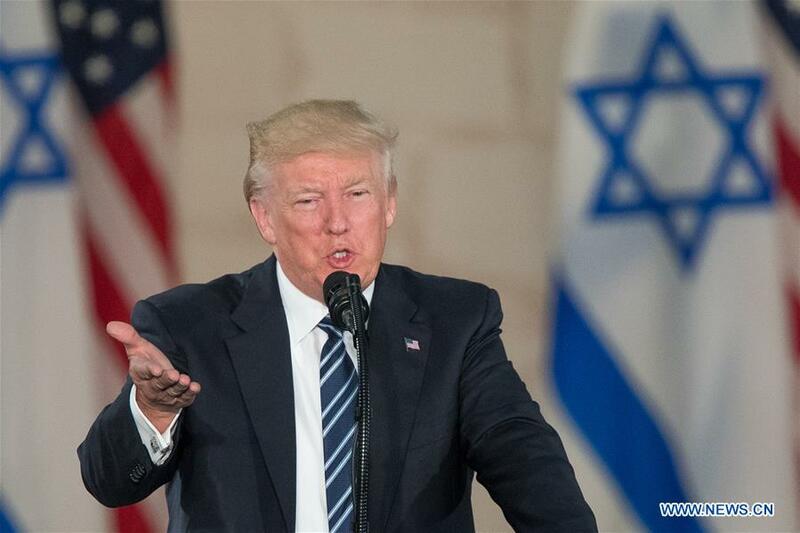 WASHINGTON, May 24 -- In a sharp break from his predecessor Barack Obama's Mideast policy, U.S. President Donald Trump is cozying up to Israeli and Arab leaders in a bid to isolate Iran, U.S. experts said. In a first for any newly elected U.S. president, Trump paid a visit to Israel and Saudi Arabia in his first overseas trip as president. The trip was made not only in a bid to gain help in defeating terror group Islamic State (IS), but also to contain what Trump believes is a threat from Iran, the experts said. "Trump believes that Iran remains an enemy...and must be contained and pushed back," Jim Phillips, senior Middle East research fellow at the Heritage Foundation, told Xinhua. Trump puts a much higher priority on U.S. national security than on human rights, said Phillips, noting Obama's strained relations with Saudi Arabia over what Obama saw as human rights issues. Indeed, Trump is dramatically changing the U.S. policy on Iran and the Middle East. After years of crippling sanctions that wrecked Iran's economy, Obama extended an olive branch to Iran and agreed to lift many sanctions in exchange for a deal on Iran's nuclear weapons program. But Trump believes that was a bad deal, and sees the U.S. relationship with Iran much differently. As such, the billionaire-turned-politician is making it very obvious, through this week's Middle East visit, that he is siding with Iran's regional competitors: Saudi Arabia and Israel. Trump is also making it clear which countries the U.S. will side with in terms of military aid, through a U.S.-Saudi weapons agreement. Announced on Saturday, the deal was made in a bid to counter Iran's military capabilities, U.S. experts said. The deal included Theater High Altitude Area Defense, also known as THAAD, which is a missile defense system that experts said was made in a bid to counter any possible missile strikes from Iran, should a direct conflict ever occur. The agreement also included more coordination between Arab nations and the United States, as well as patrol boats. Meanwhile, U.S. officials are still worried about the nuclear deal reached between Iran and former U.S. President Barack Obama, as the deal allows for a broadening of Iran's nuclear infrastructure after a ten- year-period. For its part, Iran has always maintained that its nuclear program is peaceful, to be used for energy needs and medical research. At the same time, Trump is making a concerted effort to promote warmer ties with Israel, a U.S. ally and Iran's rival, after eight years of chilled ties under Obama. In a speech in Israel earlier this week, Trump spoke warmly of Israel and referred to Israeli Prime Minister Benjamin Netanyahu as "my good friend." David Pollock, a senior fellow at the Washington Institute for Near East Policy, said Trump's Israel visit was highly significant, and signified that the U.S. relationship with Israel will be much warmer than it was under the previous U.S. administration. While there may continue to be some policy differences between the U.S. and Israel, those will likely be discussed privately between the two allies and will not become a "public dispute," Pollock said. The Middle East is a complicated chessboard of players. Saudi Arabia, Israel and Iran are the major military players in the region, and Iran and Saudi Arabia are at odds in a power struggle. The two countries are in indirect conflict in Yemen. Iran backs Houthi rebels in a civil war with the government of Yemen, which is backed by Saudi Arabia. Iran's support involves weapons and training. The recent massive weapons agreement signed by Washington and Riyadh during Trump's visit could result in more Saudi weapons flooding into the conflict in Yemen. Analysts say that could make the situation there more volatile. In Syria, Iran has also deployed several thousand of its own troops to fight on the side of Syrian government forces, against the rebels who aim to topple Syrian President Bashar al-Assad. The rebels, like Saudi Arabia, are mostly Sunni, and are supported by the U.S. and Sunnis in the Arab world. Iranian President Hassan Rouhani blasted Trump on Monday for his visit to Iran's rival, Saudi Arabia, but added that he wanted improved ties with Washington.